BoatsToGo - Blog About Inflatable Boats, Inflatable Rafts, Inflatable Kayaks And More... :: New way to ride hoverboard while sitting on a wheeled cart. HomeBoatsToGo - Blog About Inflatable Boats, Inflatable Rafts, Inflatable Kayaks And More...New way to ride hoverboard while sitting on a wheeled cart. New way to ride hoverboard while sitting on a wheeled cart. In addition to electric fat tire bicycle and hoverboards that BoatsToGo sell, we are now developing new product. It will allow ride hoverboard while sitting. Riding hoverboards while standing may be dangerous, because even smallest crack or uneven pavement on a road can throw rider off balance, which may result in a fall and injury? We wanted to develop way to ride hoverboard safely, and it seems that riding while sitting is the best way to go. Our very first prototype consist of regular hand cart attached to hoverboard middle with a rope and regular beach chair placed on top. 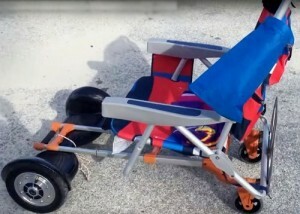 This contraption looks like a speed cart, or more like a hoverboard cart, or hovercart for short. Our next prototype we used bamboo platform and attached axle with wheels in a rear and perpendicular tube in a middle of platform. Tube has 3 holes to let distance from hoverboard to be adjusted. Now, beach chair or cooler or anything else can be attached to that platform and used for riding hoverboard while sitting. More images and videos to follow later on. This looks like an interesting concept that might work with any type of hoverboards and make riding them much safer.